Pompano is a valuable fish that is caught both commercially and recreationally. Over 90% of the pompano landed in the US is from Florida. Landings are variable but have been decreasing since 2008, largely due to management regulations. Pompano is a valuable market fish, but is rarely exported outside Florida. The fishery is well-managed and regulations exist regarding bag limits, size limits, and gear restrictions. Information on whether management is effective is uncertain, due to a lack of scientific information on the Florida pompano stocks. Pompano are inherently resilient to fishing pressure due to their short lifespan, fast growth, and quick time to mature. Currently, the Gulf of Mexico population appears to be healthy and is not overfished. There are uncertainties associated with the stock status and fishing mortality of the Atlantic population. This is due to disagreement between fishery models of the population; although in 2008 a scientific study showed evidence that the population is not overfished. The use of handlines, cast nets, and seine nets is highly selective. Gillnets have the potential to cause bycatch, but in the pompano fishery, are used in a targeted way which causes almost no bycatch. Overall, the pompano fishery causes very minimal rates of bycatch. Neither seine nets nor handlines contact the seafloor, and therefore do not typically damage the habitat. Gillnets and cast nets make contact, but are used over sandy bottoms, and therefore cause little damage. Potential habitat effects of gillnets are mitigated by their restricted use in federal waters. The effect of the removal of pompano from the ecosystem is unknown. Pompano aquaculture has only started recently on a commercial scale in the US. Production of farmed Pompano in the US is limited to two farms in Florida, and is still a small-scale operation. Around 5000lb/month is produced for sales to local restaurants. Pompano grow quickly, reaching market size after 5-7 months. They feed at low trophic levels, requiring only moderate amounts of fish protein. 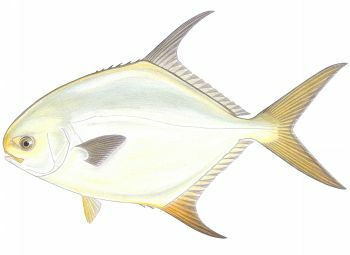 Pompano bass require relatively moderate amounts of protein, largely sourced from the sustainable menhaden fishery to grow. Broodstock is sourced from domesticated populations, thereby putting little pressure on wild populations. Risk of escape and spread of disease are extremely unlikely, as farms are located inland. Pompano aquaculture has little impact on the habitat. The water used is either recirculated, or treated before being released. The recirculating farms are not located on sensitive habitat, and take up little space. Use of chemicals is minimal. China is the leading producer of farmed pompano, followed by Indonesia, Philippines, Malaysia and India. Commercial production began in the 1990’s and has since greatly increased. China now produces over 110,000 mt a year. Although much scientific information is available on pompano aquaculture, there is little data specific to the regions that produce pompano, especially in regards to effluent and feed. Additionally, regulations regarding effluent discharge are nonexistent in China, Malaysia and Indonesia. Management is considered to be ineffective. Pompano grow quickly, reaching market size after 5-10 months. Despite feeding low on the trophic level, pompano in Asia and Dominican Republic are fed a diet high in protein resulting in an inefficient feed conversion. Broodstock is sourced from domesticated populations. Regulations do not exist to reduce the risk of escape from net pens; however, the species is already established in the area, and therefore it is thought that escapees would have few impacts on other species. Open net pens carry the risk of spread of disease to native populations, as they are open to water bodies. No evidence of chemical use was found, although it is possible that chemicals are used in an unregulated and non-transparent manner, especially given the history of habitual heavy chemical use in Asia. The discharge of waste water directly into the ecosystem has potentially serious impacts on the habitat such as harmful algal blooms and fish die-offs.